You went to Walmart didn't you! Awesome find! Awesome build. I wish I had the knowledge and tools to purchase and build a "project" Jeep! Mega-noob question, but can anyone direct me to where I can find the paint code on my TJ? Or just tell me what color this is? I’m betting it’s either bright silver metallic or silverstone metallic but swear I can’t find the barcode tag anywhere. Not in the typical door sill location? I was also leaning more towards the silverstone metallic. I’ll check the hood. and put in the jeeps VIN code, It gives you the jeeps original build sheet, which has the color name(But not the paint code). I'm actually going with the stuff from these guys: http://www.automotivetouchup.com/ . I used it a few years back on my CJ and it worked pretty well. The touch up paint in the pic below starts in the center of the rocker beneath the door and goes back to the rear of the Jeep. Midway in the rocker forward is factory paint. It blended extremely well I think, and I didn't use any sort of clear coat in that case (plan to use it this time). It's pricey at around $19/can but should do the trick. Started to work on the hood prep today. Lots of work. More work than expected. At first glance the hood looks OK at best, but the small little pieces of surface rust here and there proved to be a real bear to iron out. I think I did a pretty good job and I can still see some peeking out here and there as I'm laying down primer. Lesson learned: hoods are huge. Much bigger than I thought. I am chewing through primer like crazy and am going to run out to grab more in a few minutes. 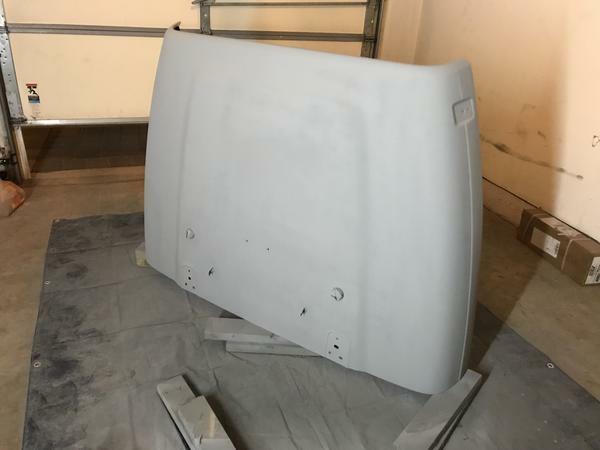 I almost definitely didn't buy enough base coat to cover this hood, let alone the fenders. In hindsight, I should have waited and bought someone else's used silver hood. This is almost definitely more work than it's worth, but I keep reminding myself that I'm probably building character or something. More pics to come. Made some more progress this afternoon and things are looking better. I may actually be able to sand down the primer in any areas that bother me to really smooth it out before the base coat comes out. 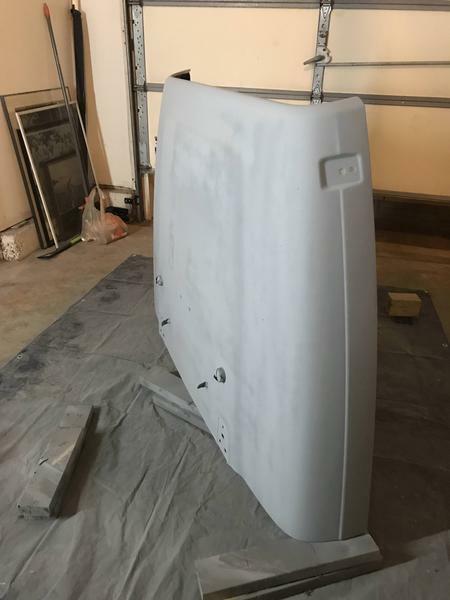 Streaky from the spray gun in a few spots, but I’m also putting more primer in areas that are going to see more road rash and rocks than others...spots like the dip from the top of the hood down to where it meets the grille, and the front lip that surrounds the top of the grille itself. I’m feeling a little better about it now but still plan to put a few more coats of primer down tomorrow. I’m without a doubt going to need gobs of base coat for this hood, however it should grab and hold nicely. I am chewing through primer like crazy and am going to run out to grab more in a few minutes. This is why I usually buy at least a quart (sometimes 2) of "Primer surfacer" from Mattos or some other paint supply place instead of aerosol cans. They don't really go far and don't have that much cellulose fiber in them for building up and filling in. When you think you have sanded enough, you can then lay a heavy coat on, and then use a large flat sander so you just hit the high spots. When you are satisfied, you do it again. Then you may even decide to do it again. Looks like you are doing pretty well - its definitely a learning experience. You will probably get by with a quart of color and a quart of clear. Don't forget any additives you may wish to add (like hardener, reducer, UV, etc.). Don't you want to remove the bumpers and nozzles from the hood? Yeah, it's on the to-do list for today. At the time when I started this it was starting to downpour outside and the tool I needed was inside my truck. Really just my laziness getting the better of me. I'll be popping them out today. Then maybe take it for a drive.